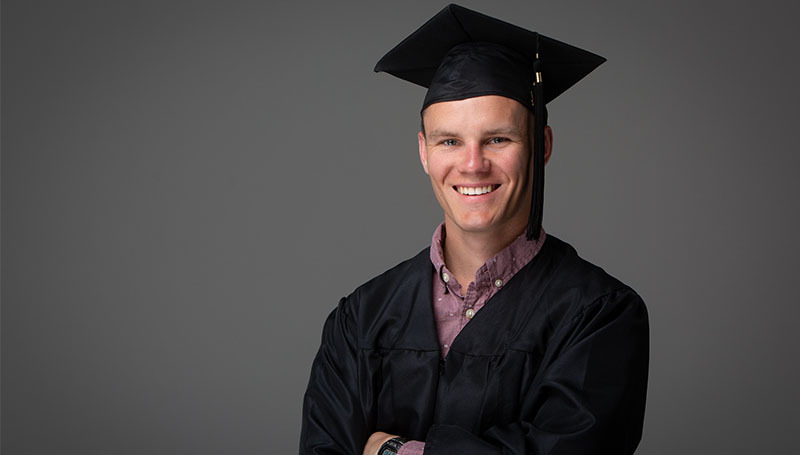 Ryan Drendel takes a moment when considering his response to being named the 2019 Outstanding Graduate at Missouri Southern State University. “I was really surprised, because there are so many other great students here,” the senior English-Professional/Technical Writing and Spanish major says. “I was excited and grateful for the honor. Drendel will be recognized during the annual Academic Achievement Recognition Ceremony, set for 7 p.m. Wednesday, April 24, in Webster Hall’s Corley Auditorium. The award will be presented by Troy Richards, president of MSSU’s Alumni Board of Directors. The list of opportunities the Naperville, Ill., native embraced as a student is impressive. In 2018, Drendel was the first student from Missouri Southern to be accepted into the HealthStream internship program in Nashville, Tenn. Prior to that, he completed an internship with the Lowell Observatory in Flagstaff, Ariz.
During his freshman year, he traveled to Paris and London as part of a trip offered through the English Department. Last year, he immersed himself in the study of Spanish during the fall semester at the Universidad Popular Autónoma del Estado de Puebla in Pueblo City, Mexico. A member of the Honors Program, Drendel says his experience there pushed him to step outside his comfort zone. He’s also a member of the university’s cross country and track and field teams, and served as one of the editors for bordertown, the campus literary publication. He’s this year’s Outstanding English Major honoree, and received first place in the Humanities Division of the 2017 MSSU Undergraduate Research Symposium (and second place in the same division in 2018). He received the Russell and Gail Smith Award for Outstanding Science Writing for 2017-18, as well as the Keith Award for Outstanding Professional Writing Student. “My parents are such hardworking people, and I know how hard they worked to invest in me and my brother,” says Drendel. “So if there there’s something I can do to make them proud and better myself, I don’t want to let them down. In nominating Drendel for the Outstanding Graduate Award, Dr. Joey Brown noted that he “used his time at Missouri Southern to learn – as much as he can and about as many things as he can. Next up for Drendel is graduate school. In August, he’ll begin working on his Masters of Fine Arts in creative nonfiction at Northern Arizona University.